The TruckNet UK Drivers RoundTable • View topic - Middle East - Not Astran! Re: Middle East - Not Astran! DEANB wrote: Simon International bit from 1974. Click on page once to read. I posted quite a bit on the Simon thread a few years ago, because they became involved with Caravan Trading (ships of the desert not mobile homes) where I subbed from and worked for for about 10 years. Skipvitesse posted photos I'd never seen and I obviously met him and must have travelled with him. I don't honestly remember him, but as he says, he preferred to travel alone and not get involved. I was more sociable. He has later become reviled on Facebook as a bullsh****r. I won't join in that, because I have no knowledge of his trips to Russia etc, but certainly everything he said about Simon International was true to my knowledge. One of my trucking correspondents is a Dutch transport historian called Hans Witte. He sent me these pics and info on DAF's involvement with Turkey and Iran. The pictures are from DAF trucks Magazines 1975, of which there were four issues per year. In the first issue of 1975 there was an article about the set up of DAF service dealers in Turkey. DAF appointed Boronkey (a well known trailer builder) as a main dealer. Two other service workshops were opened, one next to the Londra Mocamp in Istanbul and another in Ankara. In the Mocamp picture you can see 3 Rynart Fiats on the left. The blue is from Rinus (M. Rynart), the cream and green trucks were from his brother Frans (Rynart Transport). Can't see any shunting going on, although the DAF in the lower right pic does look as if it has been in the wars a bit. Oddly, it looks as if the leading DAF is a six-wheeler, the others being 4x2s, yet the "ink" seems a bit smudged over the leading axle. Whose are those lorries bringing up the rear? [zb] anorak wrote: ...Whose are those lorries bringing up the rear? The liveries look "British" to me, particularly the leading trailer. I wondered if any of the old boys on here recognised them. These multiple-vehicle photos invite this sort of thing- it's irresistible . driver of the Dakar-rally, with now son Gerard often participating) did the job towards the ME. On arrival and after a hot bath and a good meal another journey was planned and well paid. Cummins, anything less is a gamble! All the tilts had DAF Trucks Holland signwriting. I've known Mike for fifty years. He is a real character. My brother Andy drove Mike's 110 with me in Pete Robbins's 140 on our trip to Damascus, the first trips for Mike's newly formed company NODAG. This is documented in a T&D article from 2012, which is on my website. In fact Mike has used (with permission) a couple of photos from that trip. He also tells a tale I'd forgotten about. I absolutely hated squatting to s***. After returning from Damascus and before setting off on the next trip, I visited the hardware store and bought a lavatory seat. I fitted this to a wooden frame and put 3 hinged legs on it. It caused huge amusement to anyone who saw it - but everyone asked to borrow it! In fact, returning from Baghdad with Paul Kerr, I had some eggs at the Telex in Ankara (I'm blaming the eggs - I was no big drinker!) and I spent the next day constantly stopping to vomit and s****. That seat was a godsend. Paul got to the mocamp several hours earlier than me! Anyway, Mike's book is a really good read, and well worth the money. I meant the two vehicles behind the DAF convoy- does anyone recognise those trailers? Looks like a covered in roof rack... I bet that got a bit of attention from the border guards..
Jelliot wrote: Looks like a covered in roof rack... I bet that got a bit of attention from the border guards..
Might draw their attention from the belly-tank and the false trailer floor though ! The downside to the headboard tanks was filling them up, the filler was 13' off the ground and you needed to be a contortionist to take the cap off and on and thread the hose through a sealed tilt, but far worse was an over enthusiastic forklift driver spearing the forks through the tank when loading through the back. Never experienced a headboard tank as stated probably easy to hide on the type of trailers used in the trans europe middle east countries,in my cattle carting days we used belly tanks slung under each trailer in road train configuration they were plumbed into a common discharge line which went from the back trailer via the discharge line which was hooked into one of the trucks tanks the air pressure was controlled by a valve in the line as I recall set at 4 psi was all that was needed to pump fuel from the rear tank to the prime mover,as you can imagine it wasn't a fast procedure but it could be switched on and off with a simple air switch mounted in the cab obviously prime movers and trailers needed to be all common to one another and belly tank discharge wheel valves open when refuelling on the move which i did on a regular basis. It could be easy to forget it but when fuel was discharging through a tank breather you smelt it before seeing it.I only did that once fuel in those days was about 48 cents a gallon and the clean up of the mess after was time consuming and messy so lesson learned. The trailer in the pic was originally one of my cattle trailers the tank held 900 litres it had been cut down from 1200 litres and with 3 of them plus 1500 litres in the trucks tanks we had a range of around 5500 kms which was about 6 days between refuels when we were busy. mushroomman wrote: Centrum had a large fleet in the 70's/80's, they were a Dutch company who employed a lot of Turkish drivers. Does anybody have any info on this one, Arthur G. Evison from Radcliffe-on-Trent. Hi Dean, I had to collect a load of machinery once from Knights of Old at their Cherry Hill depot for a new factory that was being built near Ankara, Turkey. This was sometime in the early eighties and after I had loaded the yard foreman gave me three very large vinyl stickers and told me to stick one on the back of the trailer and one on each of the cab doors. When I asked him why, he said that if I happened to brake down then anybody who came along working for Trans Arabian Freight would stop to help me. As I didn't want to upset him I put one on the back of the trailer, I drove out of the yard and kept the other two for over twenty five years. Photo courtesy of Knights Of Old website. I have just been looking at The Scrapbook Memories thread and I came across this on Page 4 so I hope that Bubbs won't mind me reshowing it. 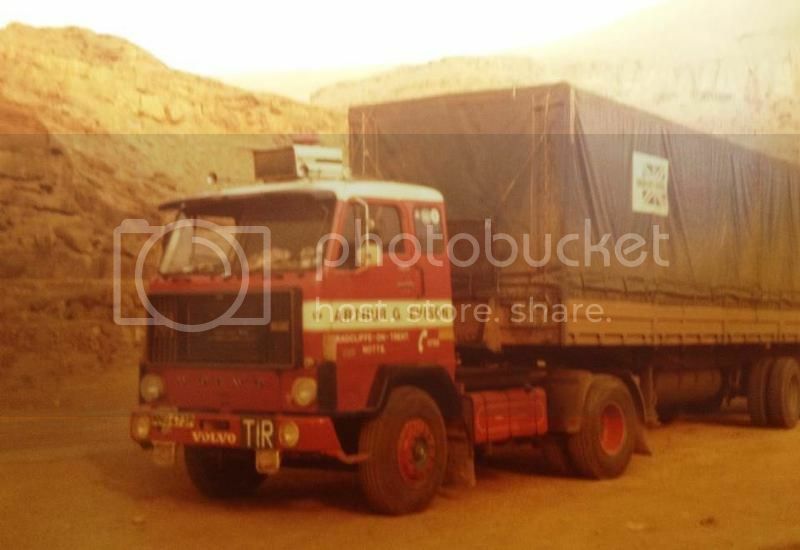 Foden in the Middle East.